"Card sharps" redirects here. 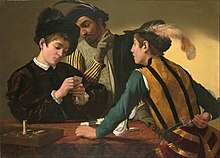 For the painting, see The Cardsharps (Caravaggio). "Card shark" redirects here. For the TV game show, see Card Sharks. For other uses, see Card Sharks (disambiguation). The Cardsharps (ca. 1594) by Caravaggio. Le Tricheur à l'as de carreau [fr] (1635) by Georges de La Tour. Card-sharpers by Candlelight (1845) by Feliks Pęczarski, National Museum in Warsaw. A card sharp (also cardsharp, card shark or cardshark, sometimes hyphenated) is a person who uses skill and/or deception to win at poker or other card games. "Sharp" and "shark" spellings have varied over time and by region. The label is not always intended as pejorative, and is sometimes used to refer to practitioners of card tricks for entertainment purposes. In general usage, principally in American English and more commonly with the "shark" spelling, the term has also taken on the meaning of an expert card gambler who takes advantage of less-skilled players, also called an advantage player, without any implication of actual cheating at cards, in much the same way that "pool shark" or "pool hustler" can (especially when used by non-players) be intended to refer to a skilled player rather than a cheater or swindler. A card sharp or shark (by either of the gambling-related definitions) may be a "rounder" who travels, seeking out high-stakes games in which to gamble. Card sharps who cheat or perform tricks use methods to keep control of the order of the cards or sometimes to control one specific card. Many of these methods employ sleight of hand. Essential skills are false shuffles and false cuts that appear to mix the deck but actually leave the cards in the same order. More advanced techniques include culling (manipulating desired cards to the top or bottom of the deck), and stacking (putting desired cards in position to be dealt). Dealing the cards can also be manipulated. Once a desired card or cards are located they can be controlled and dealt as the cheater wishes. This is called a false dealing; if a card is dealt from the bottom it is called bottom dealing and if it is second from the top it is called second dealing. Two cards could be dealt as one or the second card from the bottom could be dealt, hence the Greek deal and double deals. Dealing may also be done from the middle of the deck, known as the middle deal or center deal, but is almost always performed as a display of skill rather than actual cheating. Stage magician and actor Harry Anderson (of Night Court fame) made several appearances on Cheers as card sharp "Harry the Hat". In Friends season 2, episode 10, "The One with Russ", Ross debates with his doppelgänger Russ about the correctness of the term "card shark" vs. "card sharp". Homicide: Life on the Street season 7, episode 3, "Just an Old-fashioned Love Song", features the homicide investigation of a woman who made a living as a card sharp, but whose gambling on other games sank her into substantial debt, with dire consequences for herself and her extended family. On Mission: Impossible, members of the Impossible Missions Force (particularly Rollin Hand), would often use their card sharp skills as part of a mission. In Prison Break, the character Theodore "T-Bag" Bagwell is an expert card sharp, who says, "there are maybe five people in this country who can do what I do with a deck of cards." T-Bag uses this skill successfully in season 1, episode 18, "Bluff". Sanford and Son featured an episode wherein card sharps defeated Lamont at poker. Fred was able to defeat the card sharps and win Lamont's money back, in season 2, episode 6, aired October 27, 1972. In the Japanese anime Cowboy Bebop, characters Fay Valentine and Spike Spiegel both exhibit card sharping skills, usually at the expense of their partner, Jet Black. In Arrow season 1, episode 21, "The Undertaking", Felicity Smoak poses as a card sharp, so that she and Oliver can infiltrate a private casino to extort information about Walter. In Downton Abbey series 4, episode 3, Edith's love interest Mr. Gregson expresses his pleasure in beating a "card sharp", Mr Sampson, who was a card snark of the first degree. In Person of Interest season 2, episode 18, "All In", Harold Finch and John Reese are given information about a former card sharp who is forced into being a mule for a casino owner and drug dealer by picking up money from a dead drop and intentionally losing it in his casino. In the British reality TV show The Real Hustle, co-host Paul Wilson is an expert card mechanic who uses his skills to demonstrate scams. In I Dream of Jeannie season 5, episode 25, "One Genie Beats Four of a Kind", Jeannie helping Tony and Roger at their poker games leads others, including Dr. Bellows and a fellow astronaut, to believe they are card sharps. To compound things, the other astronaut is actually a mobster in disguise who intends to rub out Roger (whom he suspects is the real card sharp), until Jeannie turns the tables on him. The antagonist Luxord, of Organization XIII in Kingdom Hearts II, is a gambler who fights with dice and cards, and uses card tricks as the majority of his attacks. In League of Legends, the champion Twisted Fate is a card sharp. His attacks consist of throwing magical cards and using his skills to earn extra gold. ^ a b Hawkins, Joyce M.; Allen, Robert, eds. (1991). The Oxford Encyclopedic English Dictionary (hardback ed.). New York: Clarendon Press. p. 1334. ISBN 0-19-861248-6. – gives only the negative meaning for both; labels negative verb "to sharp" archaic. ^ a b c d Chapman, Robert L. (ed.) (1983). New Dictionary of American Slang. New York: Harper & Row. p. 380. CS1 maint: Extra text: authors list (link) – gives both positive and negative meanings for both "shark" and "sharp", labels them synonymous in this context, and indicates that positive sense of "shark" arose much later than the negative meaning, and later than it did for "sharp"
^ Partridge, Eric (1983). Origins: A Short Etymological Dictionary of Modern English. New York: Greenwich House. p. 614. ISBN 0-517-41425-2. – gives only negative meaning for "shark", and gives "sharper" as synonymous, without addressing the shorter form "sharp"
^ Onions, C.T. (ed.) (1994). The Oxford Dictionary of English Etymology (hardback ed.). New York: Oxford at the Clarendon Press. p. 817. ISBN 0-19-861112-9. CS1 maint: Extra text: authors list (link) – gives only the negative meaning for both "shark" and "sharp"
^ Soukhanov, Anne H. (sr. ed.) (1994). Webster's II: New Riverside Dictionary (hardback ed.). Boston: Riverside Pub. Co. p. 1072. ISBN 0-395-33957-X. – gives both for "shark", only negative for "sharp" and "sharper"
^ Guralnik, David B. (ed.) (1982). Webster's New World Dictionary of the American Language (Revised) (Revised Ed. (paperback ver.) ed.). New York: Warner Books. p. 547. ISBN 0-446-31450-1. CS1 maint: Extra text: authors list (link) – gives both for "shark", only negative for "sharp"
^ "American Heritage Dictionary of the English language (online Fourth Ed.)". Bartleby.com. Houghton Mifflin. 2000–2006. pp. "sharp" dfn. noun 3 &amp, "shark" dfn. noun 2. Retrieved 2007-07-08. – gives both meanings for both, with positive being primary for "sharp" but negative for "shark"
^ Maskelyne, John Nevil (1983). Sharps and Flats. Casino Press. ISBN 0-87019-049-0. ^ Johnson, Karl (2005). The Magician and the Cardsharp: The Search for America's Greatest Sleight-of-Hand Artist. Henry Holt and Co. ISBN 0-8050-7406-6. This page was last edited on 2 February 2019, at 12:34 (UTC).